Being a contact sport with a lack of protective gear and a lot of running, jumping and tackling can make soccer a dangerous game. 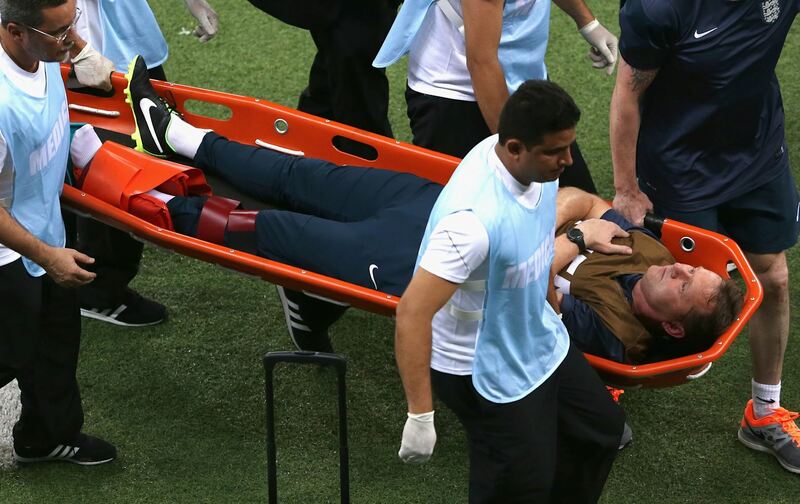 From bloody noses to hamstring pulls and broken limbs, here are some of the nastiest injuries sustained at the just concluded World Cup 2014 in Brazil.Phew, nothing good really comes easy, I guess these boys really work for their fame and fortune!!! Germany's Bastian Schweinsteiger reacts as blood flows down his face after he was fouled during their 2014 World Cup final against Argentina at the Maracana stadium in Rio de Janeiro July 13, 2014. 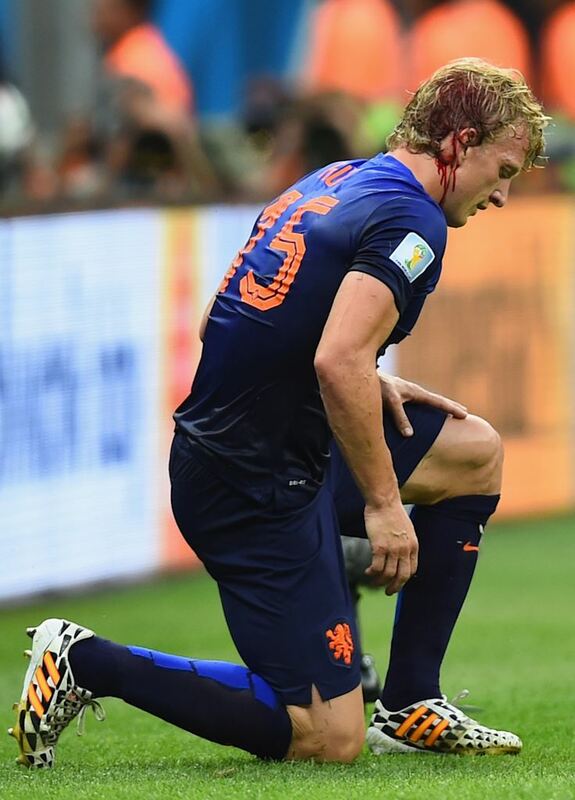 Dirk Kuyt of the Netherlands bleeds from the head after a collision during the 2014 FIFA World Cup Brazil Third Place Playoff match between Brazil and the Netherlands at Estadio Nacional on July 12, 2014 in Brasilia, Brazil. Neymar was kneed in the back by Juan Camilo Zuniga of Colombia during the Quarter Final match between Brazil and Colombia on July 4, 2014. 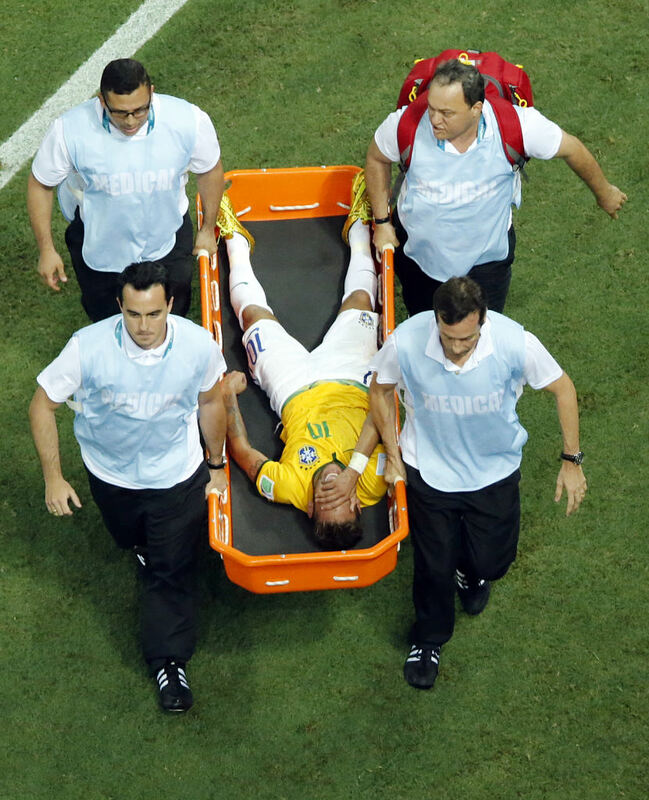 He was stretchered off the field and immediately taken to a local hospital. After contesting a header with Ghana's John Boye and taking a shoulder to the face, German midfielder Thomas Mueller was left with a bloody cut above his eye and required five stitches. 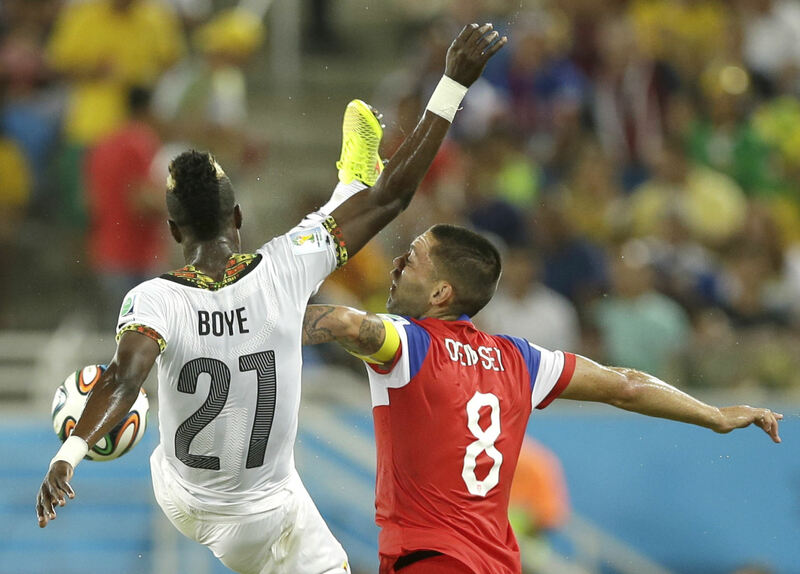 As this picture painfully shows, Team USA star Clint Dempsey took a high kick straight to the face during the U.S. vs. Ghana matchup on June 16, 2014. 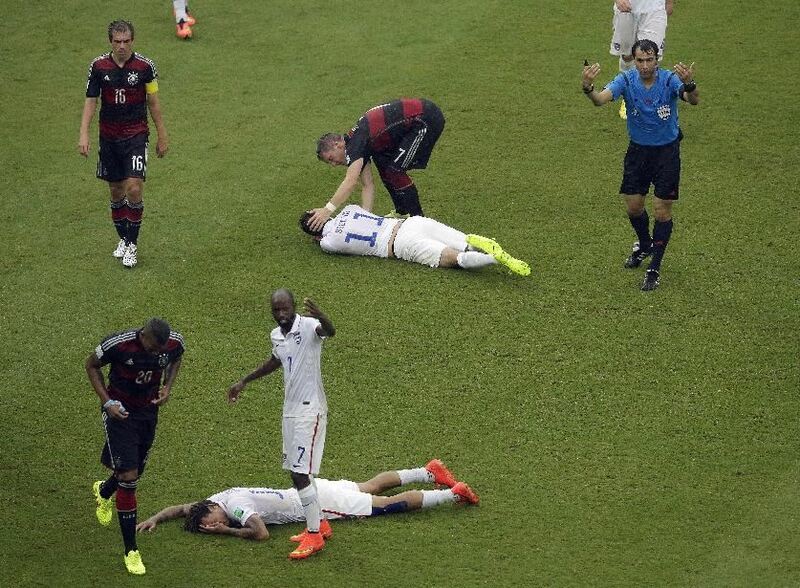 Dempsey was left with a bloody and broken nose, but continued playing. After the match, he said: "I think it is broken. I was having trouble breathing and I was coughing up blood a little bit. I did feel tired, but hopefully I will be able to start breathing through my nose again and look forward to the next game." 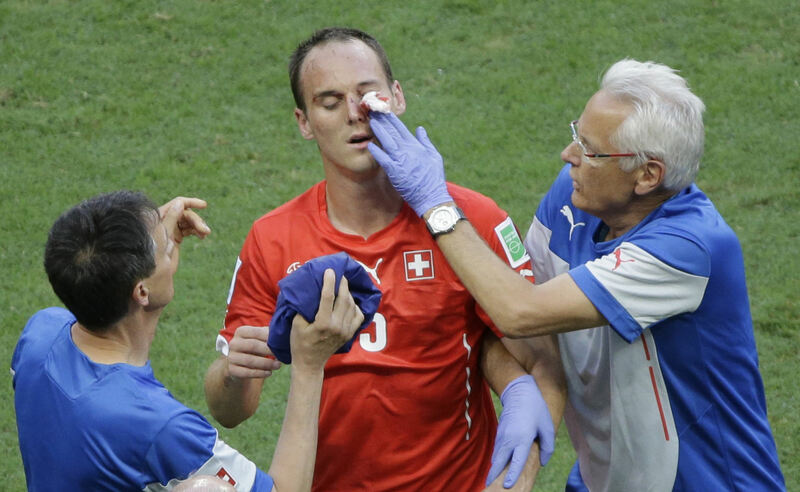 Swiss player Steve von Bergen sustained a broken facial bone after being kicked in the face by France's Olivier Giroud during the group E match on June 20, 2014. Netherlands defender Bruno Martins Indi suffered a concussion after being fouled by Australia's Tim Cahill and landing hard. Martins Indi spent a night in hospital and missed the next game against Chile, but returned to training a few days later. Bruno Martins Indi of the Netherlands receives treatment after a challenge during the Group B match between Australia and Netherlands on June 18, 2014. 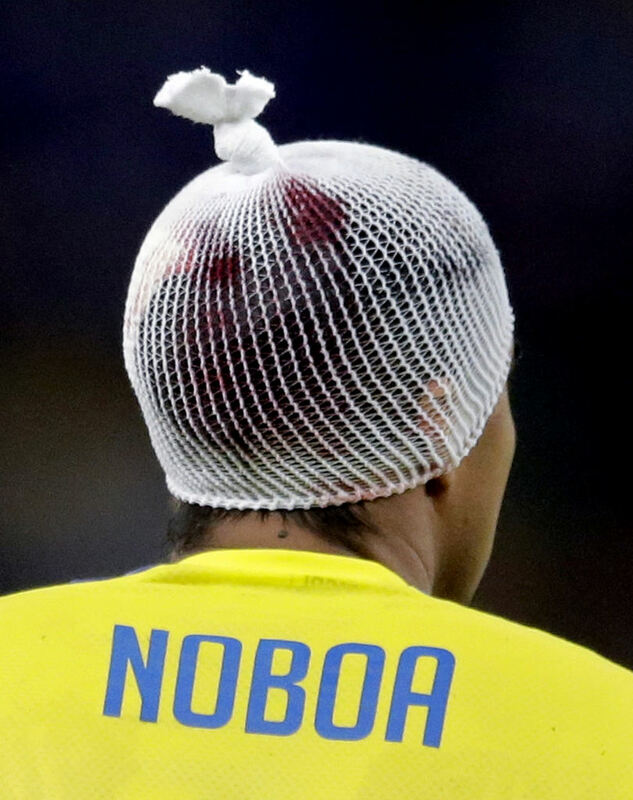 Ecuador's Cristhian Noboa not only suffered a head injury by going up for a header against France's Blaise Matuidi, he then had to endure wearing this bizarre hairnet to keep his bloody bandage in place. U.S. fans grimaced almost as much as Jozy Altidore when the star forward pulled up with a hamstring injury in just the 20th minute of their World Cup opener against Ghana. 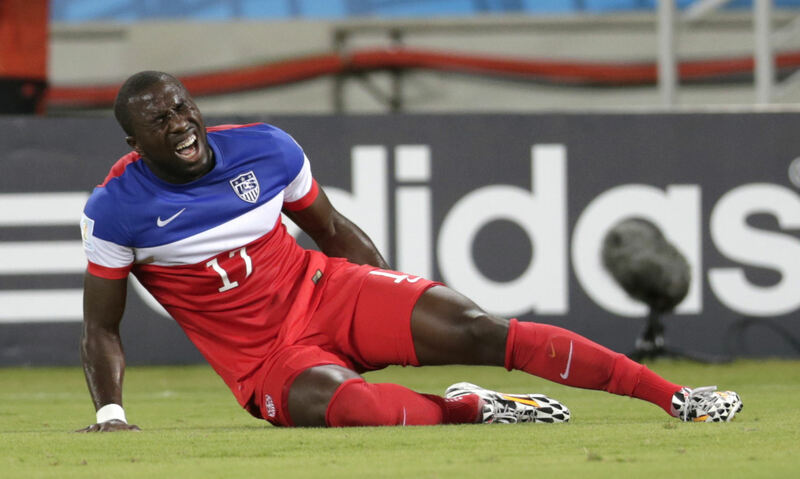 It was confirmed as a strained left hamstring and Altidore was forced to miss the next two U.S. games. 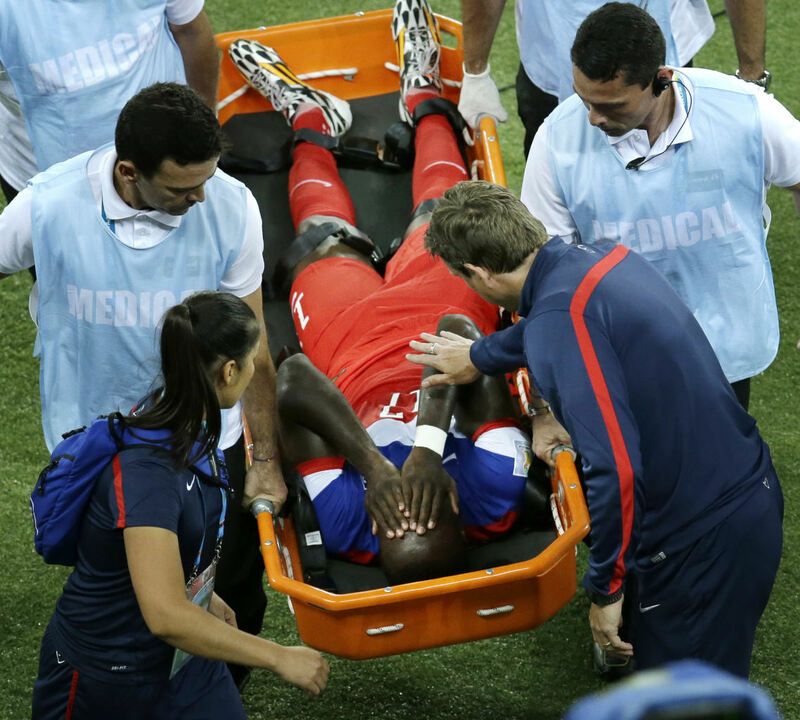 Jozy Altidore is stretchered off the field after straining his hamstring during the Group G World Cup match between Ghana and the United States on June 16, 2014. Talk about an unintentional hand ball. Nigeria's Michael Babatunde sustained a broken wrist after his teammate Ogenyi Onazi belted a shot against the Argentinian goal and it hit Babatunde's arm. 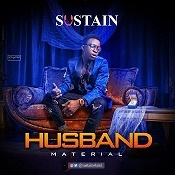 Onazi later joked, "I swear that was a sure goal if not for (his) hand." Nigeria's Michael Babatunde is carried off after breaking his wrist during their Group F match against Argentina. After the match, the Nigerian coach stated that Babatunde was being treated but would need at least three weeks to recover. 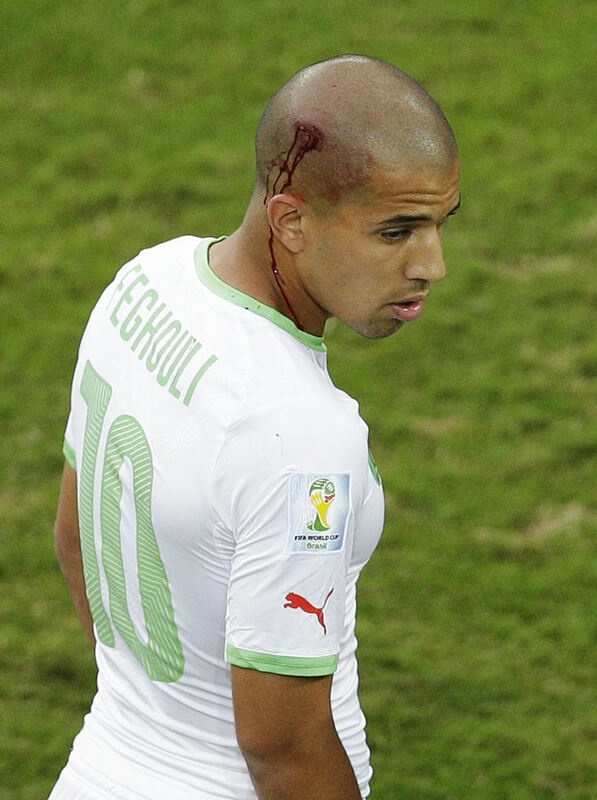 Algeria's Sofiane Feghouli took a nasty knock to the head during the group H match between Algeria and Russia on June 26, 2014. The Algerian trainer bandaged Feghouli's wound on the sideline and he returned to the game. Yes, those are Luis Suarez's bite marks on the shoulder of Giorgio Chiellini. Uruguay's Suarez inexplicably sank his teeth into the Italian defender during their Group D match on June 24, 2014. After an investigation, FIFA announced that Suarez would be banned for nine matches. Argentina's Pablo Zabaleta grimaces after sustaining an injury following a collision with Dirk Kuyt of the Netherlands (unseen) during extra time in their 2014 World Cup semi-finals at the Corinthians arena in Sao Paulo July 9, 2014. 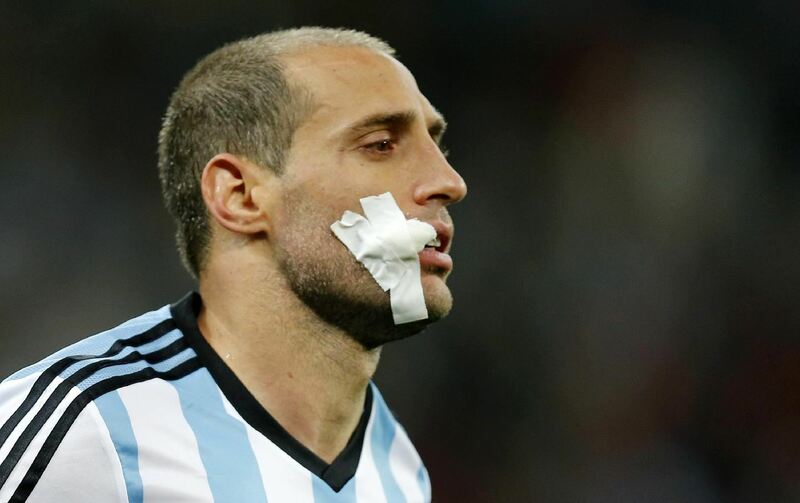 Argentina's Pablo Zabaleta has his face covered with gauze during the World Cup semifinal soccer match between the Netherlands and Argentina at the Itaquerao Stadium in Sao Paulo, Brazil, Wednesday, July 9, 2014. Perhaps the weirdest injury of the World Cup so far, England trainer Gary Lewin managed to dislocate his ankle by jumping up to celebrate a goal against Italy and coming down awkwardly on a water bottle. 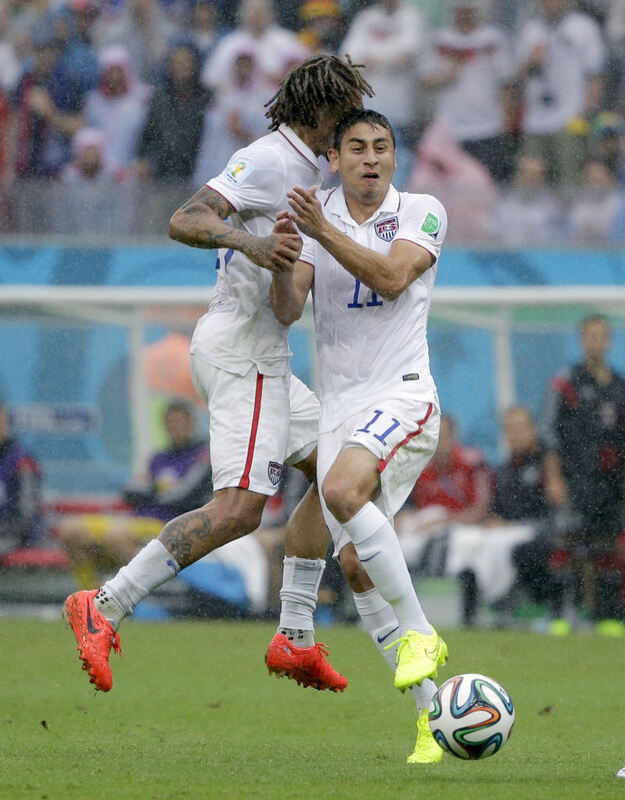 U.S. players Jermaine Jones and Alejandro Bedoya decided to put their heads together during a difficult match against Germany on June 26, 2014. The clash left Jones with a suspected broken nose and Bedoya with a nasty headache. Bedoya later said: "It was just a weird collision ... I didn't see him actually ... My head hit his nose so I am not surprised it is broken." Portugal's Fabio Coentrao pulled up suddenly during the Group G match against Germany on June 16, 2014. Coentrao was diagnosed with a "second grade tear of the adductor longus muscle in the right thigh" and was ruled out of further World Cup play.